A classically inspired tiled entrance and chevron patterned wood floor lead to brasserie style velvet banquette seating and the main bar – clad with an elegant gray marble showcasing a custom glass oyster station and illuminated back bar shelves. 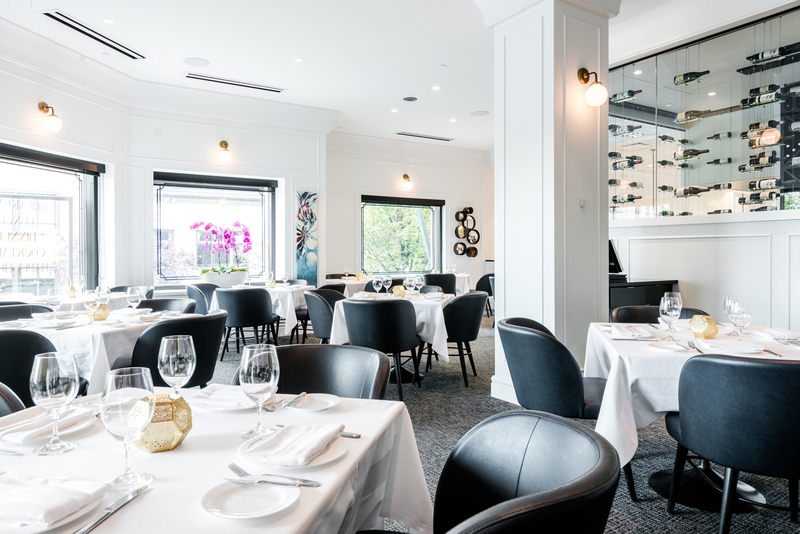 Upstairs at The Courtney Room provides an elevated dining experience in a carpeted space with white tablecloths, and a glassed-in wine room. Vintage style lighting, leather touches, brass accents, and bronze beaded curtains add layers of elegance, whilst the smoky grey/blues, taupe and elegant earthen hues continue the feel and flow of the hotel’s colour palette throughout the restaurant. Reservations are recommended.